We’d love your help. Let us know what’s wrong with this preview of The Sundering by Richard A. Knaak. In the final, apocalyptic chapter of this epic trilogy, the dragon-mage Krasus and the young druid Malfurion must risk everything to save Azeroth from utter destruction. Banding together the dwarves, tauren and furbolg races, the heroes hope to spark an alliance to stand against the might of the Burning Legion. For if the Demon Soul should fall into the Legion's hands, all hope for the world will be lost. This then, is the hour...where past and future collide! To ask other readers questions about The Sundering, please sign up. The Persian translation seemed very rough and it wasn't illustrated though... I couldn't enjoy it much. Do you think the same way?? Warcraft: War of the Ancients Trilogy is a book trilogy written by Richard A. Knaak set in Blizzard Entertainment's popular video game universe, Warcraft. This series contains three books: The Well of Eternity (2004), The Demon Soul (2004), The Sundering (2005). Book Three - The Sundering: The valiant night elves have been shattered by the loss of their beloved general. The black dragon, Neltharion, has claimed the Demon Soul and scattered the mighty dragonflights to the winds. Above all, the demonlord, Archimonde, has led the Burning Legion to the very brink of victory over Kalimdor. As the land and its denizens reel from this unstoppable evil, a terror beyond all reckoning draws ever nearer from the Well of Eternity's depths... In the final, apocalyptic chapter of this epic trilogy, the dragon-mage Krasus and the young druid Malfurion must risk everything to save Azeroth from utter destruction. Banding together the dwarves, tauren and furbolg races, the heroes hope to spark an alliance to stand against the might of the Burning Legion. For if the Demon Soul should fall into the Legion's hands, all hope for the world will be lost. This then, is the hour... where past and future collide! The best book in the trilogy, though that doesn't tell much. But I'll add a few points for having my favourite Warcraft character on the cover! Series review to come here! Doesn't leave too many loose ends and questions. I liked it as a whole. There is a fine line between being suspenseful and just prolonging something. In the book Warcraft: The Sundering Richard A. Knaak does an interesting job at giving just enough to the reader to still want to continue the book. It is also mixed with his imagery that also gives the reader the satisfaction of getting to here they wanted to be. This isn’t just used in this book but also in many of his other titles. While I was reading the book I myself found it very pleasing to hear about a character for so long and then be gifted with a description that made it clear to me who this character was and how they will affect the book. This may only work for this genre because hearing about a being a infinite power and then just introducing them in any other book would ruin just how characters effect the plot. In the book we hear a lot about the demon lord Sargeras and how his power is so great nothing can stop him when he arrives on the land but before this a portal must be opened in order for him to come. Before the portal is ready I heard a lot about him but never had a clear description of his appearance. So many characters in the book regarded him that it made me feel as though if I didn’t keep reading I would have miss something epic. For example in the book on page 632, Archimonde is one the demon generals and his very powerful. Many characters never wish to face him but in the part he is trying to have his master come through the portal. It says “And with the entrance of Sargeras surely imminent, Archimonde threw everything into the battle”. In the book failing Sargeras meant death so the fact that Archimonde spared no effort to fail told me this when I read it. It told me that since one of the most calm and collective characters just went all out, told me that the “great” Sargeras that I had been hearing about was coming soon. Hearing that made me read faster to get to the part. The drawback was that I didn’t pay as close attention to details because I was rush reading to get tot hat part. I guess thought it worked because it did keep me reading the book. Also on page 679, Mannroth is another demon lord who is trying to keep the portal open for his master Sargeras. During that he queen of the night elf race comes to see his progress. She says, “I find myself disappointed with the lack of order taking place before the arrival of Sargeras”. She is another figure who’s presence is highly regarded so I took this as a way of saying there are some who even want Sargeras to come through. With all this, it again made me rush to just finally just get a glimpse of Sargeras. In the end the book did make you want to read it so it did accomplished a book primary goal but as for that I believe that’s all. If you didn’t read the previous installments in the series then reading this book wouldn’t much fun or in the least bit as good to read. Knaak created a truly epic story in this trilogy, taking the story and universe of Blizzard's award winning game series and creating memorable characters, an intriguing plot, and fantastic battles. He had to play in a world where many readers will already know most of the storyline, but didn't let that stop him from delivering a very enjoyable series. "The Sundering" has to wrap up all the loose ends of the previous two books, and it does that in a very nice manner. I read most of this book in 2 sittings, as I was eager to know how everything would finish up. And normally I'm not a real fan of too many battle scenes, but the final battle in "The Sundering" is very enjoyable; Knaak has a knack for writing good battles. I would say it isn't a fight that should be missed. As I've said about the other books in the trilogy, "The Sundering" is full of lore that will make any Warcraft fan happy. I loved knowing what happened to Illidan...how he went evil. How Malfurion became the first of the druids. Why Mount Hyjal is an important part of the landscape. Little things will likely click into place in your mind as you read the book; I know I have some new questions and theories about why things are the way they are in the Warcraft universe. The War of the Ancients is a trilogy I'm apt to read when I'm a little sick of playing World of Warcraft, and it almost always generates interest in playing again. It took me a while to finish this, because I put it down a lot to read other books but I'm glad that I've finally finished it. In the last book of this story arc, you can understand how Illidan was driven mad by not just the powers of the Burning Legion with their seductive ways of ultimate power but also by his intention to do good. All he ever really wanted was Tyrande, and it tipped him over the edge to find out that she had chosen Malfurion. Rhonin, Krasus, Brox and the dragonflights are all It took me a while to finish this, because I put it down a lot to read other books but I'm glad that I've finally finished it. In the last book of this story arc, you can understand how Illidan was driven mad by not just the powers of the Burning Legion with their seductive ways of ultimate power but also by his intention to do good. All he ever really wanted was Tyrande, and it tipped him over the edge to find out that she had chosen Malfurion. Rhonin, Krasus, Brox and the dragonflights are all at work too in the concluding book and it's a precursor really to The Shattering, because a little is mentioned about how Nelfarion is driven mad by power. Мислех си да дам три или четири звезди, само и само да се заям с Ричард Кнаак, ама сърце не ми даваше :) Тази книга разкрива съдбата на един от най-най-любимите ми литературни герои - Броксигар, който се жертва, за да спаси света! Знам, че литературата изобилства от герои, които се жертват, за да спасят света, но Броксигар е толкова уникален и неговата история е толкова докосваща, че сърце не ми дава да дам по-малко от пет звезди. This review has been hidden because it contains spoilers. To view it, click here. I spent all day in bed, unable to put it down. The ending was a little anticlimactic, but Broxigar remains my favorite character. There is such a depth to the characters and to the world. The author does such a great job of staying true to who the characters are and yet gently nudges them to evolve. It is now one of my favourite series and is on my reread shelf. A perfect finale to a great story. The sheer ecstatic joy I got when I finished the last lines of it made me happy for many weeks. One of the best moments and feeling in my life. این سه گانه رو صبح تا شب ، شب تا صبح خوندم ، واقعا زیبا بودن ، مخصوصا که دوران جوونی و شروع سه تا شخصیت ایلیدن ، ملفاریون و تیراندا هست. فداکاری شجاعت و احساس توی کتابهای وارکرفت خیلی قشنگ بیان شده و بخش مهمی از زندگی من رو تشکیل میده. A strong finish to a very cool story. I loved Malfurion as a character and really enjoyed reading about his youth as the first druid in this pivotal conflict that sets the stage for the entire future of Azeroth. This book and series was pretty well written, but I think Knaak has a weakness in writing action. I often disagreed with his word choice and wished he would use more concrete nouns when describing action, it was often difficult to clearly imagine what was physically going on in the scene. A strong finish to a very cool story. I loved Malfurion as a character and really enjoyed reading about his youth as the first druid in this pivotal conflict that sets the stage for the entire future of Azeroth. This book and series was pretty well written, but I think Knaak has a weakness in writing action. I often disagreed with his word choice and wished he would use more concrete nouns when describing action, it was often difficult to clearly imagine what was physically going on in the scene. This review has been hidden because it contains spoilers. To view it, click here. Amazing. The pace picked up a lot in this book and flowed lore together quite well. What happened to Brox, however, saddens me. I couldn't believe that happened and only wish more respect was paid to him (in World of Warcraft). The book answered a lot of great questions (why are Illidan's eyes as they are, etc.) Now that I've finished the book, I will sleep. Stejně jako předchozí díly je tohle velmi hezké, decentní, nenáročné fantasy. Všechno dobře dopadlo, Malfurion se dal konečně dohromady s otravnou, nudnou Tyrande, ork hrdinně zahynul pro dobro světa, Nozdormu se osvobodil z časové anomálie a Plamenné legii všichni nakopali zadek. Akorát Illidan mě zklamal, myslela jsem že bude lepší badass a ne že se pořád bude snažit zachránit elfy. A moc se mi líbila postava kapitána Shadowsonga :) Prostě hezké, za mě tak 4.5 hvězdičky. Another good book in the series for people who are interested in the lore behind the Warcraft universe. I must say that this trilogy was a little "battle-heavy" which tends to make my mind wander while I'm reading it. It has all the good characters in WoW history though, and it's awesome to know the story. The author does tend to repeat things a lot, like the word "newcomer". All in all an interesting read though. The last book of the trilogy. It ends up by closing all branches of the story and concludes with the main characters being themselves before it plumage to the Warcraft III game. Also introduces one of the main antagonists in the game as well. Which spurns out towards the World of Warcraft background lore. Out of the trilogy, this has been the best of the 3 books. Better written and full of action, to match the feats of strength displayed by the characters. Once more, this book offers tremendous insight into lore and allows any Warcraft or WoW player the chance to learn and understand the great imagination and artistry of those that came up with this incredible Universe. An excellent end to the trilogy. I love Richard Knaak's Warcraft books. Even though I already knew the outcome of the story from playing the games, it was still an entertaining read. 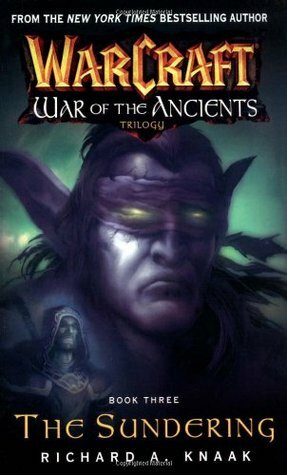 I highly recommend the War of the Ancients trilogy to anyone who is interested in Warcraft lore or fantasy in general. A superb ending to the trilogy. This is the best of the three in my opinion with all my favorite characters from warcraft lore, including Illidan, Netharion, Rhonin and Krasus. I've noticed that in every warcraft book Richard A. Knaak writes, he includes usally Rhonin and Krasus or only Krasus. Incredible... best book in the series and it makes the whole journey worth it. “Good battle! Many deaths to sing of! Many warriors to praise for the blood they've spilled!"